OK, so yesterday . . . 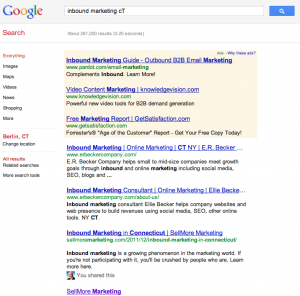 I made a post on this blog: “Inbound Marketing in Connecticut”. Today — just one day later — I do a search on Google for what I’d like to think a prospective client might type into Google assuming, of course, that they were interested in ‘Inbound Marketing’ and entered (as many do) a geographic factor i.e. ‘Connecticut’. Relevance Makes You Rise To The TOP! Well, lo and behold . . . My post is found on PAGE 1 of the Google search for the phrase (some call it a ‘long-tail keyword’) that was the title of my post. (you can check it for yourself — click the image to open in a new window!). What Were The Ingredients That Worked? First, It was only 230 words (quality beats quantity in a blog post, folks!). Second, I used the keyword phrase ‘inbound marketing’ but in a meaningful and relevant way. Third, I included a video that was ranked well on YouTube. Fourth, I used the phrase (keyword) ‘Outbound Marketing’. Nothing magical there. Just basic SEO that you can do, too. Something is missing from yesterday’s post, though. Can you tell what it is? If not, I’ll share it tomorrow. Content attracts people who are looking for what you do . . . so plan to use it effectively in 2012. One of many changes I’ve seen this year is the movement toward marketing that focuses on ‘Inbound’ strategies and tactics vs. ‘outbound’ strategies and tactics. It’s kind of cute . . . but also accurate to depict the ‘old’ with the ‘new’ marketing along the lines of the famous Apple vs. PC commercials . . . Enjoy! In 2012, we live in a robust web-based world — based on the fact that tweets, texts, email on your smartphone, and even McDonald’s has free WIFI. You may or may not like that but . . . you can’t really ignore it, either. The fact that we’re so digital has irrvevocably changed the world as we (once) knew it. Not too long ago, if you were going to ‘do some marketing’ . . . you were likely thinking about running ads, making phone calls (cold calls! ), sending out direct mailings, attending trade shows and the like. Without a web-based medium (i.e. the Internet), what other choices did you have? None, really. Today, the options and expectations for marketing your business have changed. Seriously changed! The name for the new approach is ‘Inbound’ (vs. outbound) marketing. This refers to being found — online — by people who want and are searching for what you can offer and/or do for them. It’s a ‘Brave New World’ . . . are you planning to be in it?